Early Saturday morning I found myself standing with a crowd of lunatics who call themselves ultrarunners on a remote Mt. Titlis cable car station in Central Swiss Alps, to the south of Lucerne in Switzerland. The altitude was 1,800 meters. They call this the MountainMan. "The Mountainman is a one day race for extreme and endurance sports people who are strong enough to run on single trails around the BergArena of Unterwalden. The unique route starts at the Mt. Titlis and passes on its length of 80.3 kilometers and 5000 meters of ascent deep blue mountain lakes, wild rock faces and breathtaking views into the high peaks of the Berner Alps and the beautiful valleys beneath, before it ends at the peak of Mt. Pilatus." The sky was almost cloudless with a shining moon. That was appropriate as I was wearing moon boots aka Hoka One One Bondi B. My favorite shoes had finally disintegrated, and I had nothing else to wear on my feet. My left forefoot had developed a weird spot of pain that hurt every step. My right foot had adopted plantar fasciitis last winter, a painful condition that has no easy cure. I just tried to ignore my injuries and think positive. I refuse to take any medication for the pain. If I have to stop, then I will stop. According to the weather forecast it was going to be a sunny day, possibly one of the hottest ones this summer. However at the moment there still was a gentle but freezing wind that made runners in shorts and singlets shiver. I took my OMM Kamleika suit from Raidlight Olmo 5L backpack and put it on. In addition to rain gear we were required to carry some first aid bandages and bandaids, Swiss francs (which used to be under 70 cents, but might soon be more valuable than €), and a mobile phone. I also had a desert cap, gloves, SiS Go gels, two full water bottles enhanced with nuun Kona Cola, Salt Stick caps, paper tissue, Mountain King Trail Blaze telescopic aluminium sticks, and a drop bag with essential stuff like Red Bull Cola that I could access in the middle of the race. By the way, I didn't plan any of this. 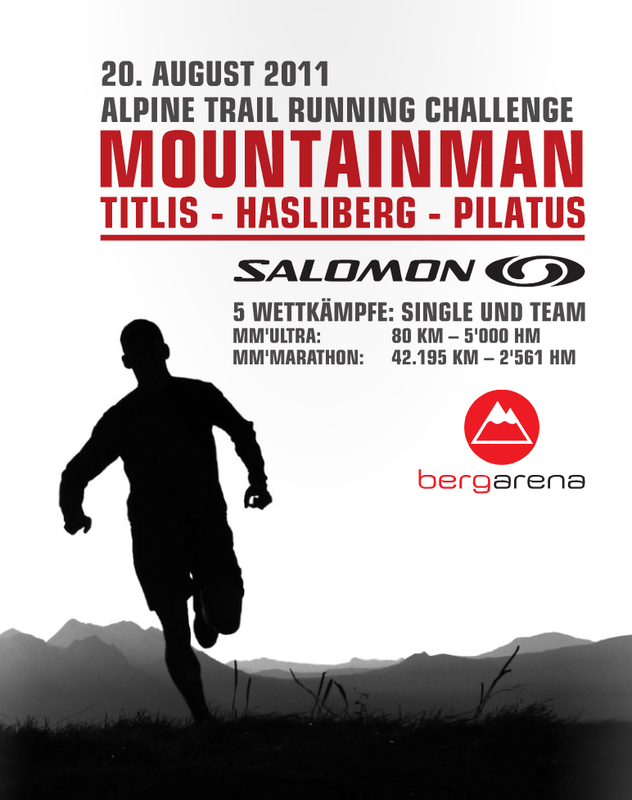 I had noticed the first edition of this 50-mile Alpine trail running challenge last year, when they ran the same course as today, but in opposite direction. 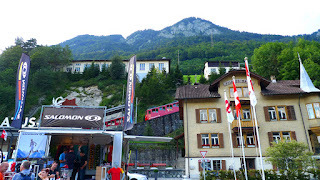 I needed the three points to apply for UTMB 2012. A man has to do what a man has to do, and so on. Down in the valley the train from Lucerne arrived in Engelberg. The passengers would soon join me up here for a 6:30 AM start. I had some time for music: Learning To Fly. 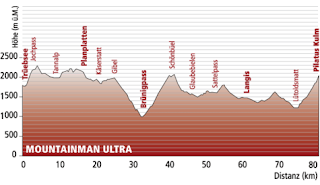 Lütholdsmatt (74.8 km) 19:30 (13h from the start). This race is a complex logistical challenge, as the finish line is located in a totally different place, on top of Mt. Pilatus. The race office is in Alpnachstad, the town with the railway station that is known as the starting point of the steepest cog railway in the world (48%). Fortunately a friend of mine had agreed to drive me around. First from Zürich Airport to Alpnachstad on Friday afternoon, then to a hotel in Hergiswil by the Lake Vierwaldstätter, and then to Engelberg on Saturday morning. I figured crewing wasn't necessary during the race, as the race organization seemed very efficient and effective, as seems to always be the case in Switzerland. At the designated starting time 6:30 AM they were still waiting for the last competitors to arrive. The RD announced that the start of the event was going to be delayed by a few minutes. At 6:38 he finally shot his little fireworks rocket up into the dawning sky, and it was time for me to fly across the Alps. Ice is forming on the tips of my wings / Unheeded warnings, I thought I thought of everything / No navigator to FIND my way home / Unladened, empty and turned to stone / A soul in tension that's learning to fly / Condition grounded, but determined to try / Can't keep my eyes from the circling skies / Tongue-tied and twisted just an earth-bound misfit, I. After the start we began our first steep climb to Jochpass, the highest point of the course at 2,323 meters. The single trail had metal gates that allowed us to pass through slowly one by one. A long queue formed up on the mountainside, and I stopped to drink and eat. I also removed my OMM rain jacket and trousers, as the weather was getting warmer. It was going to be a sunny day with no clouds in sight. Soon we passed Tannensee and Melchsee lakes, close to a mountain hostel I had been staying for a couple of weeks in 1995 while training for my first Alpine ultra trail race. The wider paths allowed me to start passing people. I felt better than in any race this year. My Hoka shoes seemed to be perfect for the Alpine terrain. At one point there were big yellow signs every 100 meters for a 1K or so, with black skulls and text "DANGER OF FALLING" or something like that. 16 years ago I couldn't dare to take this route, but it wasn't such a big deal anymore. After a very long and steep downhill, I arrived at the first cutoff in Brünig around 11:30 AM - with 2.5 hours to spare. It was the lowest altitude of the course, at 968 meters. I grabbed some food and drinks and pushed on without any extra delay. I didn't even add any sunscreen, as I thought it would take too long. There was a huge climb ahead. Actually it was much more challenging than expected. It's certainly not an ideal course for someone with vertigo issues. The climb was only 8 km long, but it seemed to go on forever. It was getting hot, around 32 degrees C (90 F), and everyone was sweating bullets. There were Alpine Rescue Service volunteers once in a while to check us out and cheer us up. They gave us helpful advice as "The next section is a bit dangerous, so make sure not to fall down!" The views towards Lake Brienz and the magnificent mountain trio of Eiger, Jungfrau and Mönch made it all worthwhile. The Swiss call this area Panoramawelt. There were some tourists and locals out there hiking, but they all gave us weirdos with race bibs way politely. Finally I could see the next aid station at Schönbüel, but there was one more challenge to be crossed: a narrow path with nothing but air on both sides. I didn't dare to look down when I crossed it. I just focused on getting across step by step. Occasionally I'd try to automatically balance myself by hitting the ground with one of my poles, but there was no ground to hit - except much further down below of course. 41K done, less than 40K to go. Now it was time to run as fast as I could, or else face DNF due to strict cutoffs. Unfortunately we would have to cross the largest moorlands of Switzerland: the Glaubenberg. A fellow competitor asked "Can we make it in time?". I made quick calculations in my head and answered diplomatically "Yes, if we run, and do not walk". We decided to go for it, desperately running in a small group of die-hards. Back home in Finland we have lots of swamp, so I'm very familiar with it - but I just hate to run in that slippery wet muddy stuff. To be honest I had to walk most of it. They had put lots of round tree logs on the path, but it didn't help much and was still very slow going. Sometimes there was a section of relatively easy dirt roads, and we took full advantage of those sections. After Sattelpass aid station (53.4 km done, 26.9 km to go) the Langis 18:00 cutoff was 6K away. We had over an hour left, so I knew we could make it there on time. What I was really worried about was the 74.8 km cutoff in Lütholdsmatt, and also the final 15 hour time limit on top of Mt. Pilatus. At this speed, we didn't have a chance. We would have to accelerate 30-40% from our current best speed, and that wasn't likely to happen with shot quads, blisters and general exhaustion. And a lot of it would be steep uphill. At this point I was running with Guido, a Swiss dude who is about the same age as me, ie. the big 5-0 next year. Sometimes he would try to keep up with me, then I'd blow up and try to keep up with him. He had DNF'd in that horrible thunderstorm during TVSB 110K last year like I did. He was apparently in great shape this summer, as he had finished TVSB in July in about 28 hours - despite arriving at the mountain hut at 88 km (where I quit due to freezing weather) 10 minutes after me. Anyway, Guido seemed to read my thoughts and asked with his dry sense of humor: "Still having fun?". We both knew that the final cutoff times were too strict and we were not going to make it. I just replied "I was thinking the same thing". Guido's official DNF time at 59.5 km cutoff in Langis was 11:18:52. I arrived there right after him, in 11:19:28. It was one of the saddest moments and hardest decisions of my life. We felt good enough to continue, the weather was fine, we had no reason to quit - except the absurd cutoff time that would require us to run the next 15.3 km in about 100 minutes. That's 6.5 min/km, which would be a piece of cake normally, but impossible for us with these legs. It also made sense to quit here and not elsewhere, because only Langis was along an asphalt road easily accessible by car. The winner took only 9:06 to finish, but not everyone can be elite. 61 competitors out of 171 (36%) in this ultra race (there was also a marathon and relay races) were brutally forced to DNF, most of them quite experienced and accomplished trail/ultra runners. I guess the organizers had their reasons for doing this, but man, did it hurt not to be able to become a MountainMan after all that effort! Guido asked "Are those big shoes of yours any good?" and I replied "Yes they look funny, but they're not bad at all - actually I like them now and will use them again". Then his wife Rita picked us up and drove us back to Race HQ in Alpnachstad to grab our drop bags. I wanted to tell everyone what a fantastically scenic course this was, how incredibly good the weather was, how I'd experienced one of the best adventures of my life, how the friendly & fabulous the volunteers had been, and how proud I felt for being able to overcome my frightening moments of vertigo on the mountains. I went swimming in the huge Alpine lake to cool off my stinking and aching body. A state of bliss of sorts, I guess, nevertheless. Above the planet on a wing and a prayer / My grubby halo, a vapour trail in the empty air / Across the clouds I see my shadow fly / Out of the corner of my watering eye / A dream unthreatened by the morning light / Could blow this soul right through the roof of the night / There's no sensation to compare with this / Suspended animation, a state of bliss / Can't keep my eyes from the circling skies / Tongue-tied and twisted just an earth-bound misfit, I. 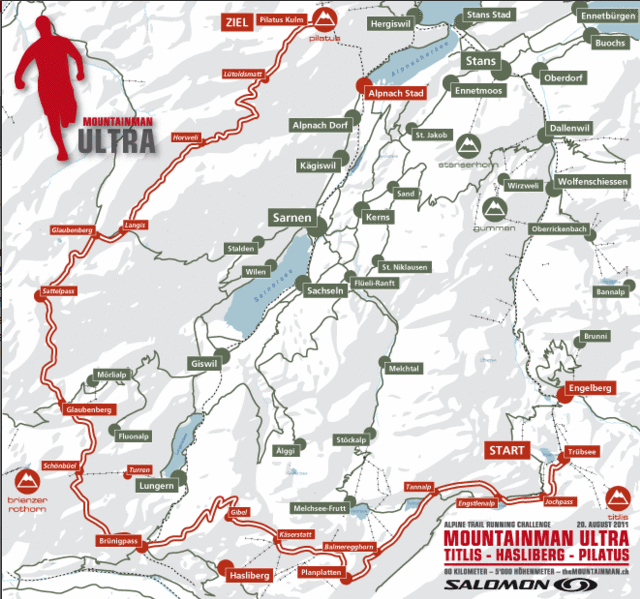 What it takes to finish UTMB?